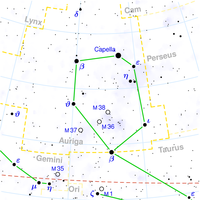 Capella, also known as Alpha Aurigae or less formally as the Goat star, is a star system located 42 light years away. It is the brightest star of the constellation of Auriga, and the sixth brightest star overall in the night sky. The star is the third brightest in the northern celestial hemisphere, after Arcturus and Vega, and the closest first-magnitude star to the North Pole, with an apparent magnitude of 0.91. Although appearing as a single star in the night sky, Capella is actually a system composed of four stars grouped in two binary pairs. These stars appear brighter with a combined magnitude of 0.08. Capella has been known since antiquity. It is generally thought that the first known reference to the star was in an Akkadian inscription from around the 20th century BC. The name Capella itself is Latin and is derived from the Latin word Capra, meaning a female goat. Capella's position in the constellation Auriga traditionally represents the charioteer's left shoulder, or the goat the charioteer is carrying. The star was also known as Alhajoth during the Middle Ages, which may have come from the Arabic name for the star العيوق (Ayyūq), which in turn may have come from the ancient Greek αίξ (aiks), meaning "goat". For astrologers during the Medieval era, it was considered a Behenian fixed star. Capella plays a role in the mythologies of several cultures. The Romans viewed the star as representing the goat Amalthea, that suckled Jupiter. According to the same mythology, Amalthea's horn was accidentally broken by Jupiter and made into the Cornucopia, or the "horn of plenty". In Hindu mythology, the star was called Brahma Ridaya, and was seen as the very beating heart of Brahma. For the Chinese, Capella was named 五車二 (Wŭ chē èr) meaning "Second of the Five Chariots". This stems from Chinese astronomy placing Capella as one of the 五車 (Wŭ chē), translated as the "Five Chariots", along with Beta, Theta, and Iota Auriqae, and also Beta Tauri. To the aborigines of Australia, the star was Purra, the kangaroo. The Capella system is made up of two pairs of binary stars. The first pair, called Capella Aa and Capella Ab, are giant G class stars first discovered as a binary by William Wallace Campbell in 1899 using spectroscopic observations. The bright binary pair was later resolved using interferometry in 1919, and were the first objects measured using this method outside the Solar System. In 1914, the pair was discovered to have a faint, red dwarf companion by Ragnar Furuhjelm and was named Capella C. This companion was found to be also a binary pair by Carl L. Stearns in 1936, and they are now known as Capella C and D. They are class M red dwarfs, located some 11,000 AU or 0.17 light years distant from Capella Aab. Capella Aa is spectral type G8-K0 IIIe, making it a yellow-orange giant. The star is around 12.2 times the diameter of our Sun, and some 2.7 times its mass, with a surface temperature of around 4900 K. The star is 78.5 times as luminous as the Sun. Capella Aa is more massive then its binary companion, and thus further along in its stellar evolution. As such it revolves more slowly, at 3 kilometers per second, for a rotation period of 220 days. Both stars once may have been spectral class A or class B dwarfs (more likely the former) of similar mass, and are likely around 525 million years old. The more massive Capella Aa has already begun fusing helium in its core to carbon. Capella Ab is a spectral type G1 III yellow-orange giant. The star has evolved off of the main sequence, but has not begun fusing helium in its core, unlike its more massive companion. The star is 2.6 times as massive as our Sun, with 9.2 times its diameter with a surface temperature of 5700 K. Capella Ab is also some 77.6 times as luminous as our sun, making the two binaries together 150 times as luminous. The star also rotates much more quickly then Star Aa, spinning at 36 kilometers a second, taking only 11 days to complete one rotation. Capella Aa and Ab move in a circular orbit of 104 days with an orbital inclination of 137.2 degrees, and are only 0.73 AU (or 68 million miles) apart. There are no known substellar companions around the Capella Aab binary system. If an Earth-like planet existed during the stars' main sequence phase, it would be a burnt cinder now. For such a world to exist now and have liquid water comfortably on its surface, it would need to be some 12.5 AU distant. Capella C is a cool, red dwarf of spectral type M1 V. The star is some 30 to 40 percent the mass of our Sun and 56 percent of its diameter. The star is only some 1.2 to 1.4 percent of the Sun's luminosity. The binary system of Capella CD was sometimes refereed to a Capella H because the letters B through G were already used for nearby faint stars both gravitationally bound to Capella Aab. For an Earth-like world to have liquid water on its surface in orbit around Capella C, the hypothetical planet would be centered around 0.11 AU with an orbital period of 24.4 days. Capella D is the dimmer star of the Capella CD binary, with a spectral type of M4-5 V. The star has 10 percent of our Sun's mass, with 25 to 30 percent of its diameter. Capella D is merely 0.05 percent as luminous as our Sun. For an Earth-like world to have liquid water on its surface around Capella D, the orbit would have to be centered around 0.022 AU, orbiting in only 7.8 days. Capella C and D have a circular orbit with an inclination of 65 degrees. They orbit at an average distance of 48.1 AUs and take some 388 years to complete one revolution. ↑ Magnitudes given here are the total magnitudes from all stars in the Capella system. ↑ From definition of absolute magnitude, using apparent magnitude (+0.08) and distance (42 ly) given here. ↑ Calculated from given parallax of 76.20 mas. ↑ 6.0 6.1 The Brightest Stars: Discovering the Universe through the Sky's Most Brilliant Stars, Fred Schaaf, Hoboken, NJ: John Wiley & Sons, 2008, ISBN 978-0-471-70410-2; see pp. 152-155. ↑ The Philosophy of Natural Magic, Heinrich Cornelius Agrippa, Forgotten Books, 2008. ISBN 1606802607; see p. 85. ↑ Exploring Ancient Skies: An Encyclopedic Survey of Archaeoastronomy, David H. Kelley, E. F. Milone, and Anthony F. Aveni, Birkhäuser, 2005, ISBN 0387953108; see p. 322. This page was last modified on 1 May 2018, at 11:20.